Who would have thunk that a Whipped Cream image from Walmart would wind up being my number one instagram photo of the year? I know I didn't. It certainly is fun taking a viral photo, but for the record, a lot of it is dumb luck. Anyway, let's see what the fuss is about. Let's see who knows me best: how many of these came home? 2? 3? That's right, just one of them. I don't do coconut and I'm not bringing nut products home, so that leaves Hershey's as the sole survivor to jump in to my shopping cart. I sample the whipped cream and it's pretty good. It's a decent mix of cocoa and whipped cream without any crazy weirdness to it. It kind of remind me of... chocolate pudding cups I guess. I will admit that I was a little concerned after a bunch of people commented that the Reese's one is bad but the Hershey's one has potential. I mean how do you argue with a breakfast sundae that looks like this? 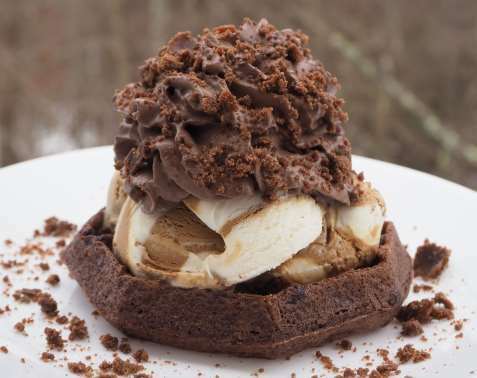 You know I don't like the bitterness of coffee ice cream, but when it is sandwiched between a chocolate waffle and the chocolate whipped topping, oh man, I hit gold with this robust flavor profile. Ok, technically this gave me heartburn, but it was still delicious and is the reason I'm recommending you go out and have some fun with this chocolate whipped topping. I tried the Reeses one. 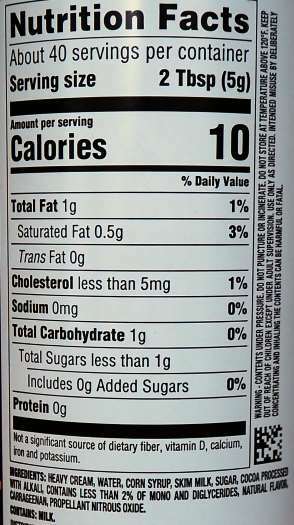 It was ok just not super concentrated in flavor. The real winner was the pumpkin whipped cream Shoprite sells! 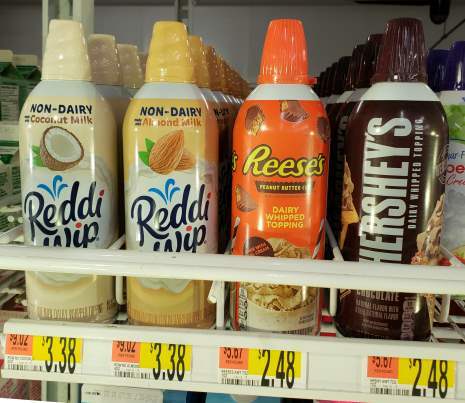 I have kids who are MASSIVE Redi Whip fans so I have tried all four varieties. We preferred the peanut butter one to the chocolate honestly. It also seemed to taste better when the ice cream pairing was just right. Here is my big warning. DO NOT BUY the coconut one. The cans are very flawed. If you don't believe me, check out the Redi Whip facebook page. There is a huge thread on the faulty nature of these cans. I bought a bunch for a children's party, and the whipped cream didn't come out of any of the cans. Other people are having the same problem. I am guessing it might have something to do with the fact that coconut milk has no proteins. This messes with the mechanism in the can. But that is just my guess. Only a bit came out then nothing more. I was fortunate that Wal mart gave me a refund on my cans. Redi Whip really needs to look into this problem. The coconut and almond milk reddiwhip are really great for the price, but I'll be sticking to cocowhip as the Reddiwhip cans are BROKEN. I emailed customer support and their tips didn't help at all.